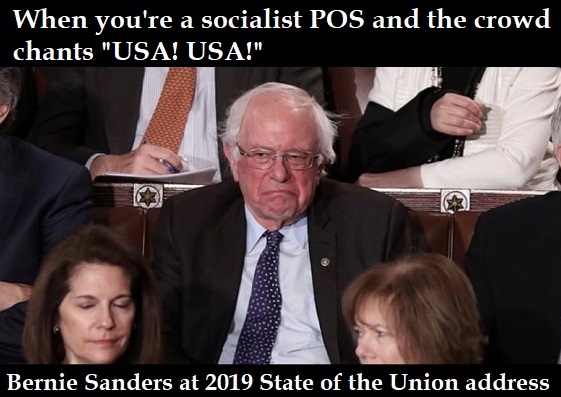 Although he had never worked at a productive job in his life, Bernie Sanders, 77, the Demonrat senator of Vermont who fancies himself an “independent” but actually identifies as an outright socialist, is that curious oxymoronic creature — a millionaire socialist with three homes. One of the three homes is a lakefront summer home in North Hero, Vermont, which Sanders purchased for $600,000 just five days after the 2016 Democratic National Convention, in which he sold out his idealistic millennial supporters by enthusiastically endorsing his rival, one-percenter Hillary Clinton who had used the Democratic National Committee to undermine his presidential campaign. The Democratic National Convention even called a SWAT team on Sanders’ delegates. On February 19, 2019, Sanders joined the ever-growing list of Demonrat freaks and communists by declaring his candidacy for the 2020 presidential election, pledging to run a campaign focused on “transforming” the U.S. and “creating a government based on the principles of economic, social, racial and environmental justice” — blah, blah, blah. Shedding his political identity as an “Independent” as readily as a snake sheds its skin, Sanders will, once again, run as a Democrat, as he did in 2016. 3½ hours after announcing his candidacy, Sanders raised over $1 million from small donations. Within a week of his announcement, Sanders had raised $10 million from 359,914 donors, including some 12,000 registered Republicans. Sanders’ insanely expansive and expensive Medicare for All will have to be funded — with what he calls tax hike “options”. A new 4% employee payroll tax: Sanders would impose another 4% payroll tax on top of existing payroll taxes. This new 4% payroll tax will be “income-based premium paid by employees,” which will increase taxes on American families and individuals by $3.9 trillion. A new 7% employer payroll tax: Sanders would impose another 7% payroll tax on employees which he calls an “income-based premium paid by employers”, estimated to be a $3.5 trillion tax increase over ten years. Eliminating health tax “expenditures”: Sanders’ Medicare for All proposal would ban employer-provided insurance and repeal the deduction for health care and the Health Savings Accounts utilized by about 25 million U.S. families, mainly the middle class. The deduction for cafeteria plans and the medical expense deduction is also eliminated. All of which will increase taxes on families and businesses by $4.2 trillion. 70% top tax bracket for ordinary income and capital gains income, which would make America the highest income tax rate in the world. According to the Tax Foundation, a top 70% rate for ordinary income and capital gains income above $10 million will raise $51.4 billion over a decade. After accounting for macroeconomic effects, the proposal would actually cost the government $63.5 billion because the proposal would suppress investment and economic growth. 77% death tax: Currently, the death tax applies to estates over $11 million and applies a 40% rate. Under Sanders’ proposal, the death tax would kick in at $3.5 million with a rate of 45%. He also proposes raising the death tax rate to 77% for inheritances. All of which will increase taxes by $2.2 trillion over ten years. Wealth tax: Sanders proposes an annual wealth tax of 1 percent kicking in above $21 million in assets. Sanders estimates the proposal will increase taxes by $1.3 trillion over ten years. Bank tax: Sanders proposes a tax on financial institutions totaling $800 billion over ten years. Broaden the self employment tax: Sanders would require business owners to report more of their business income as salary, increasing the amount of self-employment tax owed, which would increase taxes by $247 billion over ten years. U.S. national debt is already over $22 TRILLION. Imagine what Medicare for All taxes would do to our national debt. It would kill this country. HR 1384 – Medicare for All Act of 2019, introduced by Rep. Pramila Jayapal (D-WA).